the basic design is differenced by the addition of a golden border. Aiming to change the very fine basic design as little as possible and thereby to retain the historical association of the stag’s head with the locality, the amendment is slight and the colour of the added element is also that of the stag’s head to preserve the same theme and feel of the original design. The border symbolises the county’s particular geography, being a shire whose constitutent parts are encompassed within the territory of another county. 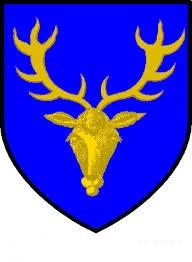 again retains the yellow and blue colour scheme of the Mackenzie arms and cleverly alludes to both the splendid antlers in the original arms of the earldom and the nickname of the Mackenzie clan chief, “caberféidh“, Gaelic for “deer’s antlers” with a knotted saltire, that symbolises crossed antlers. A notable cohesion of an obviously Scottish theme with a resonant local twist! A third proposal from Philip Tibbetts replaces the blue background of the Mackenzie banner with a black one in reference to the Black Isle upon which the town of Cromarty itself sits and around which the county was formed. The black background is much more striking, and forms a cute pun with the “black isle”. A brilliant design. Is there any hope of this being registered with the Lord Lyon? All of the Scottish counties but Cromartyshire continue to be used in administration one way or another (lieutenancy, registration, local government). Is there any way for the Court to register the design? Can the Flag Institute register a design for a Scottish area without it first being OKed with the Court? Many thanks for your interest. We would be delighted to see Cromartyshire secure a flag. The Lord Lyon is evidently very keen on community flags and given his track record, is likely to look favourably on the idea. Given the disparate character of the county and its anomalous situation in terms of councils and local administration, a competition is probably impractical but rather, as with Barra and South Uist, it would seem appropriate to settle on one preferred design and work to get that approved. Obviously you’ve expressed a personal interest in one of the designs on our blog. If you can get enough local people involved to lend the idea some legitimacy and all agree on a chosen design then you can try to push that forward. Kirkcudbrightshire’s flag was registered on the basis of a petition received from that county’s Lord Lieutenant so something similar may be possible. As the county no longer has an LL, the best option would probably be for a concerned local interest group to try this. Is there a local history society or “Friends of Cromartyshire” group or something similar? If not perhaps you may consider forming a steering group of interested citizens but it may ultimately fall under the auspices of the regional administration, Highland? Without some sort of official sanction the Lord Lyon may not approve a design for the county. So probably the best first step would be to contact Lyon Court outlining your interest in registering a flag for the county and asking them if they have a preferred process through which this may be achieved. The Flag Institute will in fact ONLY register Scottish flags if they have the Lord Lyon’s seal of approval so it’s probably best to approach the heraldry authority first and then to get in touch with the Flag Institute once you have some idea of how the land lies. Hope this is of some use and please do keep in touch and let us know of your progress if you do proceed. Happy to liaise with you on this.